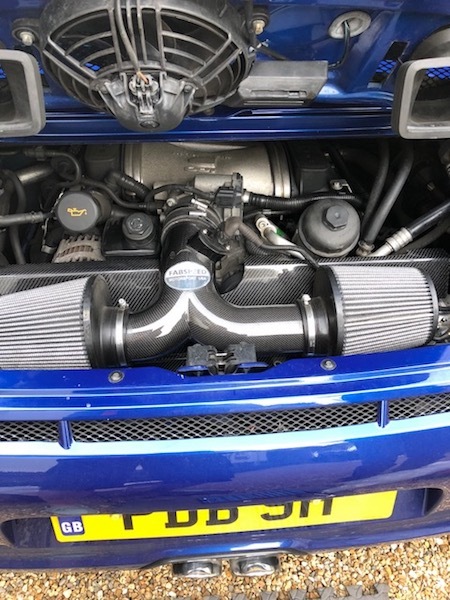 Is there anyway to block off the resonator connected to the main air intake hose; thus producing a fruitier note to an otherwise standard 997.2 Carrera? Is there a silicone cap one can obtain which allows the original hose to be re-attached so all appears standard? Does yours definitely have a resonator? My 2010 C2 air box doesn't have one at all as I was hoping to take a vacuum feed from it but the design of my air box is different to a C2S it seems. You need to make a sketch of what you want then get someone like me to turn you one up out of aluminium. Matty, the gen2 does have a resonator and unlike the GTS that has 6 modes in the resonator the S only has 1 mode , it is integrated unlike the gen1 resonator . this I think is the reason there is no mod fix for it. I have read numerous reports of guys changing the openings on the bottom of the gen2 airbox and adding white mesh , has yours got no mesh or black mesh if so it seems changing it to the white mesh type will give a sound upgrade. I haven't done this mod so can only say what I have read. Personally I started with BMC sports filters which gave a small sound gain then fitted a fabspeed carbon twin code performance induction , this made a considerable induction note gain. Personally and not knowing what you have or haven't done to get a better noice from the car , but start with BMC sports filters circa £150 then fit a rear muffler bypass circa £300 then if you still not exited by the sound of your gen2 then options are gundo hack the rear boxes circa £300 or fit an aftermarket sports exhaust anything from £800 to £5k . If you decide to do the same as me and go for the fabspeed twin cone you will need a remap as the parameters are to big for the car to relearn the values. Thanks gentlemen, outstanding as always. Phil, nice response, thank you. It would seem that the gen 2 is an integrated resonator (more Googling!). Alas, I was hoping for a quick fix like the gen 1 and my old 993. My car is totally standard, which seems daft. It’s my daily right now and I’ve done about 5k miles so just working out what direction I want to take things. There’s some truly inspiring threads on this forum.